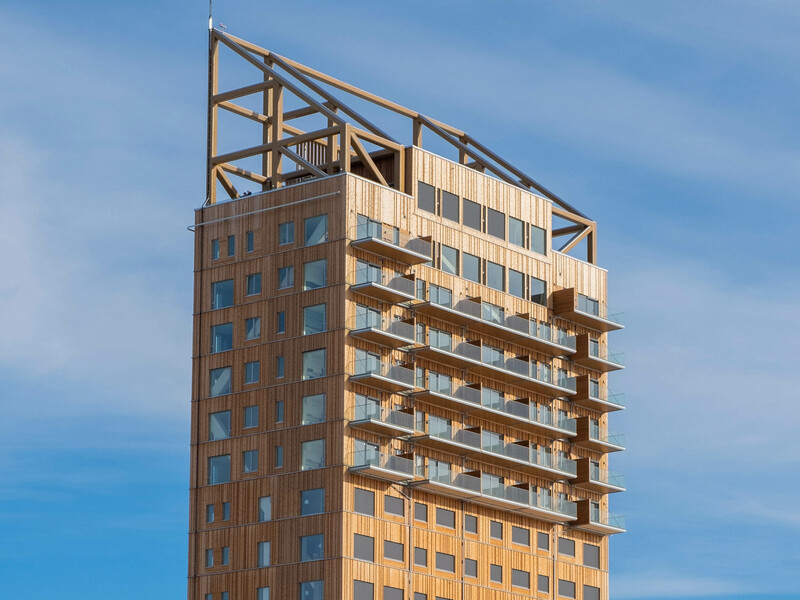 Mjøstårnet, designed by Voll Arkitekter in Norway is officially the world’s tallest timber building, according to the Council on Tall Buildings and Urban Habitat (CTBUH). Just completed this month, the 85.4-metre-high tower is made of cross-laminated timber (CLT), and has eclipsed 53-metre-high Canadian building, Brock Commons Tallwood House, as the tallest timber building in the world. Mjøstårnet is an 18-storey mixed-use building including apartments, the Wood Hotel, a swimming pool, office space and a restaurant. The building’s timber structure was installed by timber specialist Moelven Limtre. Building elements include elevator shafts made only of CLT and glued laminated (glulam) timber columns. As the building is in Brumunddal, an area with a strong forestry and wood processing industry, building materials were sourced locally. The announcement of Mjøstårnet as world’s tallest timber tower comes just as the CTBUH has changed its height criteria. With the recent growth in high-rise timber structures around the world, CTBUH has decided to officially recognise timber as a structural material, and will now be monitoring developments in timber construction.